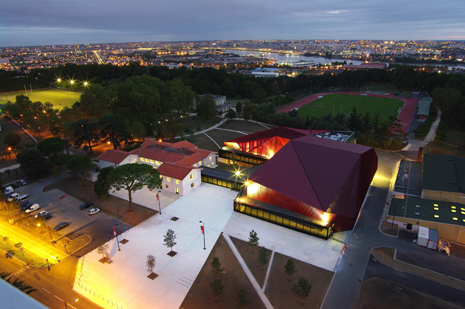 Located at a prominent location in Palmer Park on a site overlooking the Garonne River, the new facility is inserted into a natural amphitheater near a recently renovated administration building. The program called for three large performance spaces: a 650-seat theater for traditional performances, a more flexible large hall that can accommodate 1200 spectators for rock concert-styled productions, and a smaller flexible space that can be used as a recording studio or for solo recitals. The scheme by Bernard Tschumi, assisted by associate Véronique Descharrières, arranges the large open volumes according to the topography of the site, each slightly angled away from the other. The common unifying element is a folded, perforated roof of red steel, which pleats and creases to accommodate the performance volumes and circulation spaces. In the interstitial spaces between the performance venues, circulation is identified by dark glass-lined avenues that link areas of the project with a common passage. The strategy of the double envelope, common to other Tschumi designs for concert halls and performances spaces, architecturally assists in insulating the performance volumes from outside noise and keeping the park and its surroundings quiet and serene. At night, the perforated skin of the building glows with light, serving as a beacon for the community and a reminder of the Cenon’s cultural ambitions. Dedicated to world music, particularly African music, programming for the new performance venue will be eclectic, including everything from rock concerts to intimate chamber music, satisfying a regional audience where more than 50 languages are spoken locally. The center has been awarded the prestigious “Academy of Arts” title from the French government, a label that is the first to be given on a national level.